Our internet has been playing up for the last few days…it drops out very ten minutes or so. (Writing this weeks post has been an endurance test in patience!) Umpteen phone calls to our internet provider, a new modem and now a technician booked in for a home visit later in the week and I’m ripping my hair out with the frustration of it all. I am astounded at just how intricately our lives have become tied to technology. We have four laptops, three iPhones and two iPads in this house and they are constantly being used. Homework for the kiddies, Facebook, my blog and emails for me. Dudie loves Youtube and watches sailing and kitesurfing videos in every spare moment. The girls FaceTime their friends most evenings to ‘discuss’ homework and I often find recipes online for dinner prep. Having an internet connection is very much part of our daily lives. In many ways having this internet breakdown has come as a big reminder that there is life beyond ‘safari’ and ‘google’. A certain quietness has come into my day with not being able to have a quick look at Facebook or check emails as I hear them buzz in. My girls are shattered by it all…I have yet to tell them we have another few days to go before its fixed! Homework may become a much bigger issue tonight. Technology, social media and our computer driven world have come with a high cost, especially to our young people. Being a child of the late 60’s/70’s, I know the joy of a childhood spent roaming around the neighbourhood in search of friends and adventure. Of days spent just playing, getting dirty and having fun; of school afternoons with minimal amounts of homework and very little to do except enjoy NOT being at school. We were not booked into every extra curricular activity known to humans for our every spare moments…tennis on a saturday morning was just about the only extra activity I regularly did….My childhood was free and simple, delightful and mostly safe…we fell out of trees more often then kids these days! I wish so much that I could give this simplicity to my children. It breaks my heart to see just how plugged in and switched on their childhoods have become. We do our best to get them outside, to give them freedom and nature and fresh air and a taste of childhood as we knew it, but its a constant battle with the juggle to find a balance with out of school activities, school commitments, copious amounts of homework and how encroaching technology is in all of this. I don’t win all the time. 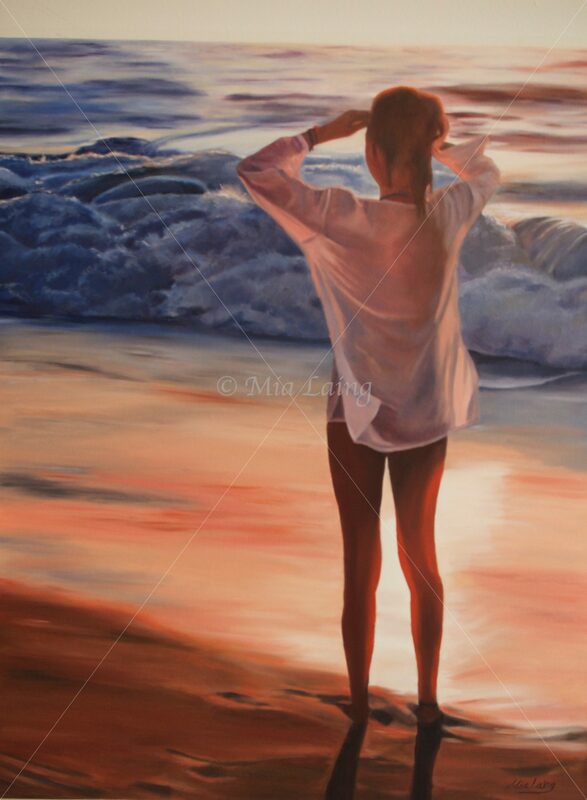 I had a burning desire to paint this image when it popped up on Facebook one day…no, its not one of my photos. I so, so wish it was. Jo Whitton from ‘Quirky cooking’ http://www.quirkycooking.blogspot.com.au is the rightful owner of this photo and was so kind and generous to give me permission to paint it. Thank you. I am truely grateful Jo. Go take a look at her site – awesome recipes, especially good for thermomixer owners and allergy sufferers. 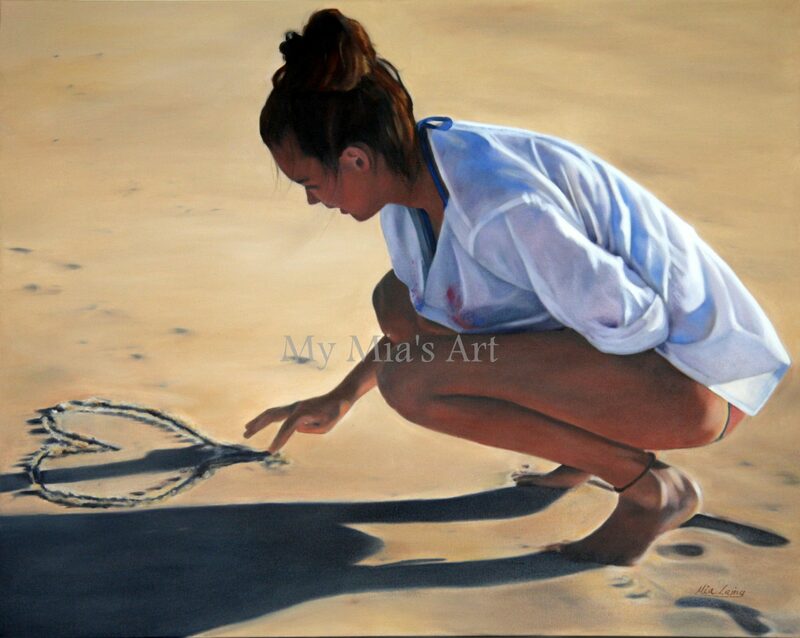 I’ve titled this painting ‘The Gift’. 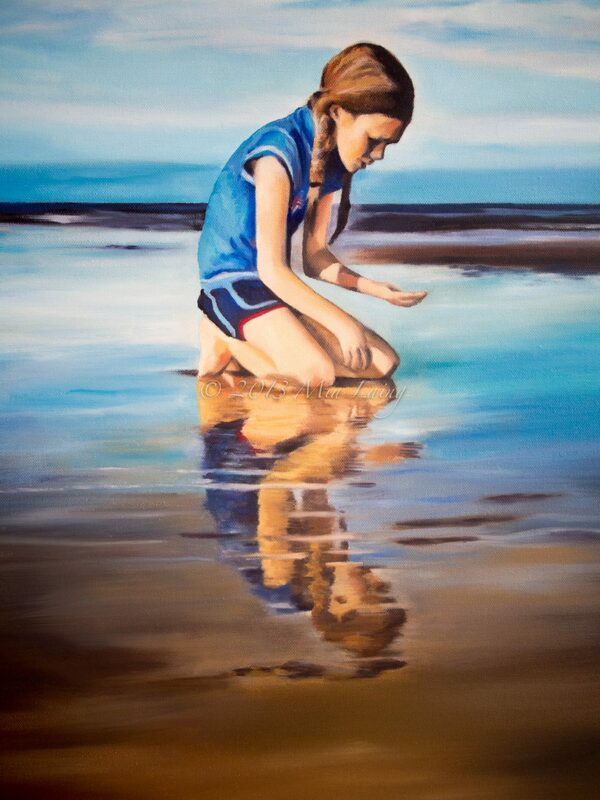 Some paintings can take a lot of pondering time and effort and calling out to my Facebook friends for their ideas on titles…but I just knew from the start that this would be called ‘The Gift’. Innocence, simplicity, gentleness…a gift to any childhood. This image embodies all of these qualities. 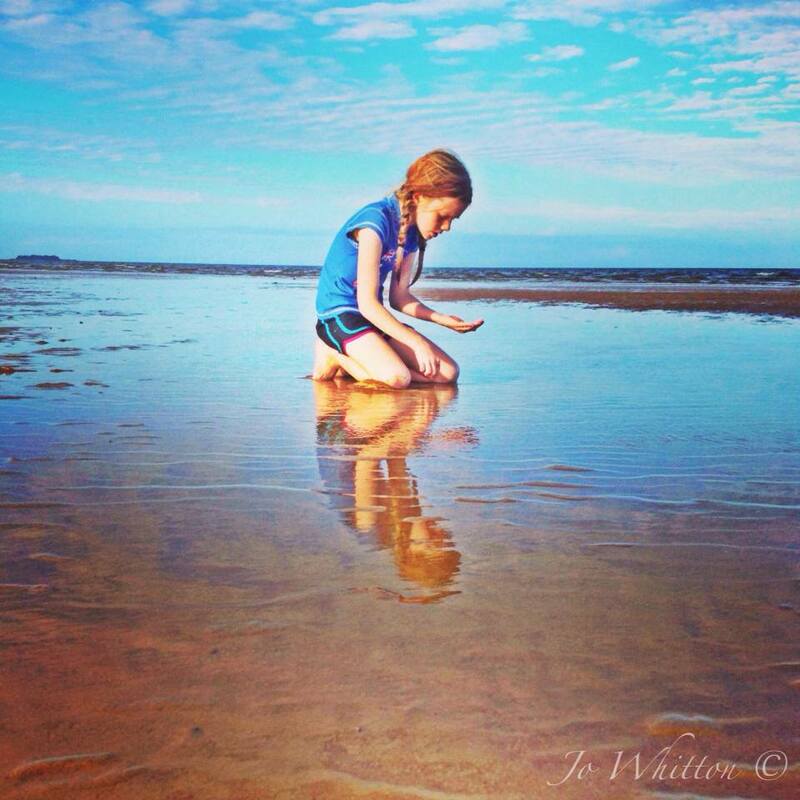 A young girl, quietly, gently playing in the shallows. 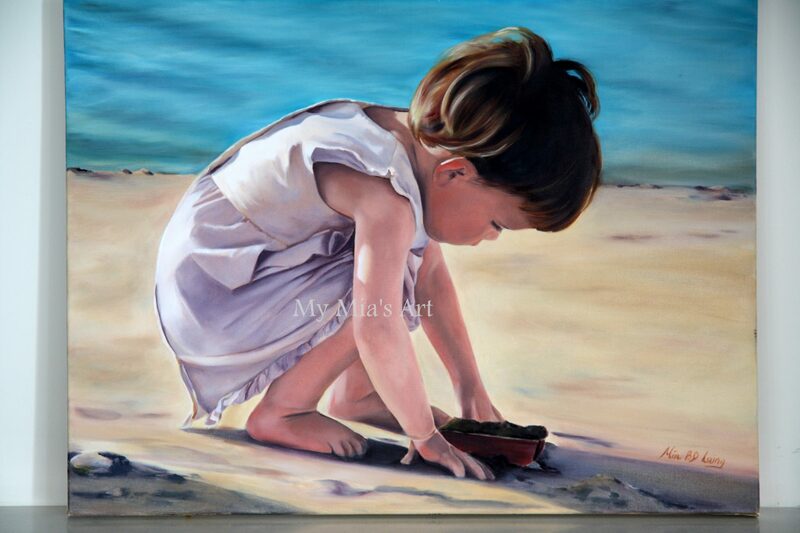 Her hands so delicately holding the treasures she has found…Perhaps a shell? A gift for her mother. 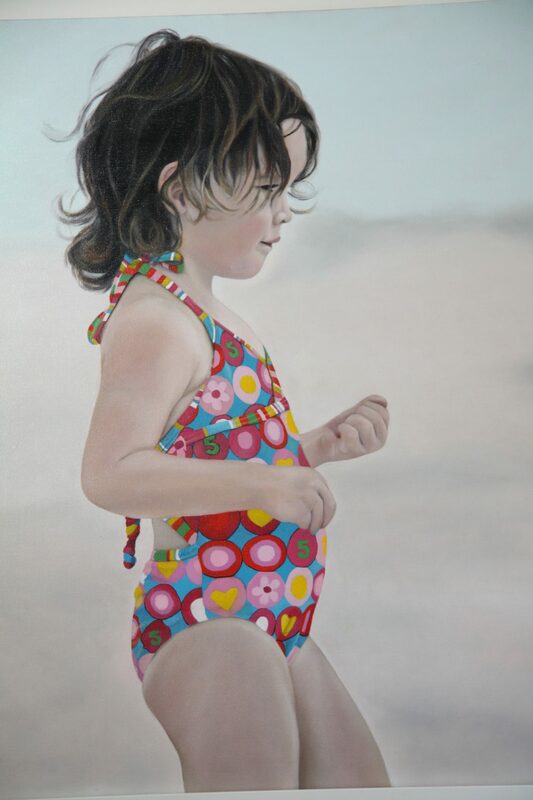 ‘The Gift” was a joy to paint. It calmed my wayward mind, brought me wonderful memories of my own childhood spent growing up by the ocean here in Perth…and helped to remind me of what I want for my own girls…a love of the sea and our gorgeous river, of nature, of warm sun on salty skin, of quiet moments, peace and tranquility. To take pleasure in the little things of life and to truly notice them and be mindful of each moment as it passes us by. 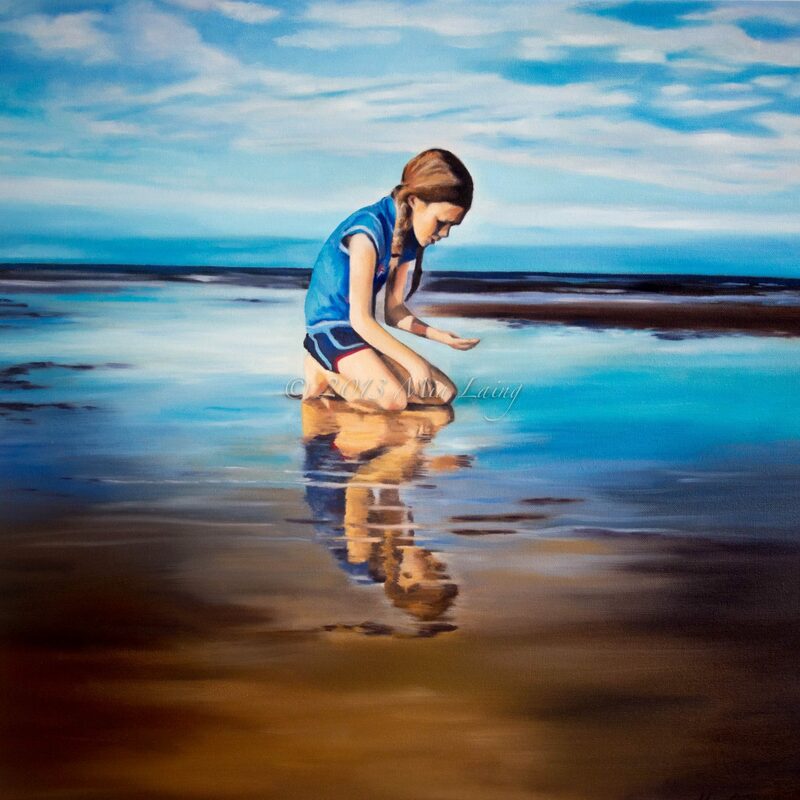 In painting “the Gift’ I had an ‘Ah Ha’ moment, that I love painting children/youth…hmm…girls, interacting with nature, in particular in a water setting. 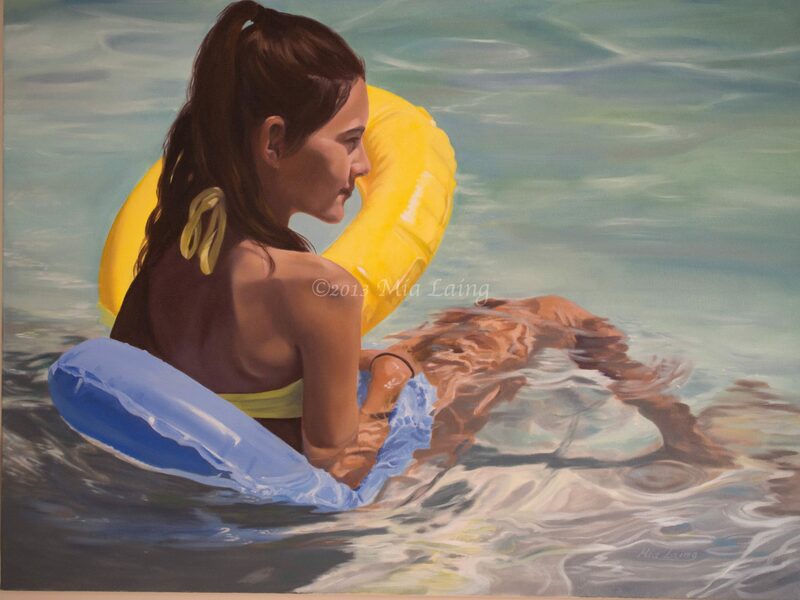 I counted back the beach/river images I have painted in the last two years….roughly ten! I think I may have stumbled upon my paint calling! Most have been of solitary figures, enjoying quiet contemplation in a beach landscape. Interesting. Very interesting. Oh dear…they are all of my girls and my nieces! I need to find some boys to paint!! Quietness, stillness, peace, calm. A connection to nature and to water. I’ve been painting my desire without realising it. Wow love your work, truly beautiful! Thought prevoking! Thank you so very much Anjee, I feel so blessed to be doing it and its nice knowing its touching other people too. Thanks for coming on to say hi! I have just come over from Jo’s FB page and I must say you have an amazing talent! If you ever need some boys to paint, I have three of them. 😉 So glad Jo shared your amazing work! I totally understand the pull of technology. It is one of those love/hate relationships. I have decided I am going to take my boys out camping as the weather starts to warm. To truly immerse them in nature and enforce disconnect from technology for all of us. Hi Bec, thank you so much for your thoughts. Technology works wonderfully in many areas (such as food and art blogs!) but needs incredible balance with this next generation. We take our girls boating, bike riding and to the bush whenever we can…toughen up Princess holidays we call them! I hope you can get your boys out camping. Such wonderful family memories are made at these times. I have an FB page too, come and say hi every now and then. Gorgeous works Mia and totally understand that you are drawn to kids the water etc as that is what I always find myself coming back to when buying a little artwork or trying to take the elusive “perfect” picture of the kids. When I get that pic there will be an email request coming your way!!! Keep snapping Judy! I’m always out with my camera waiting for that perfect image…I’ll look forward to you taking the right image! Thanks for commenting. The reflection in the painting is breathtaking. As always, a beautifully done job. I feel your pain about the break in technology…. last time this happened at home, it was like the end of the world for us. But only for about a few hours and then miraculously, we realized we could actually do other things (a revelation!) without internet. It’s coming on and off at the moment…crazy. I’ll be glad when it aback to normal but I won’t tell the kids straight away! !